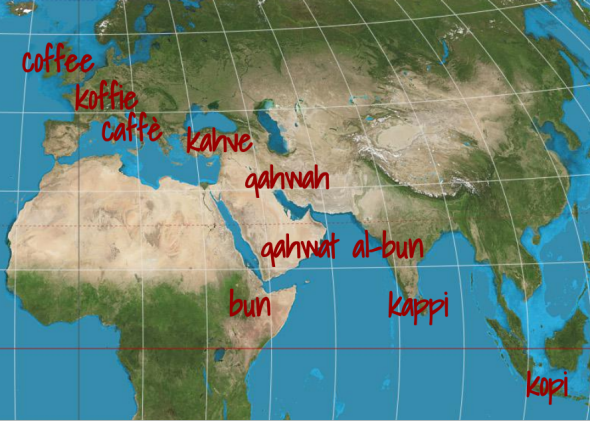 Coffee cognates: Arabic qahwah, Turkish kahve, and other cross-linguistic borrowings that make this word similar around the world. People picked up the word for coffee as they picked up a cup of the curious beverage at a coffeehouse or picked up bales of the beans en route from one trading port to another. Imagine that you’re flying Turkish Air. The beverage cart bumps down the aisle. A flight attendant holds up that little carafe and asks, kah-vay? You travel a lot. Now you’re flying Finnair. The beverage cart bumps down the aisle. A flight attendant holds up that little carafe and asks, ka-vee? Still racking up the frequent flier miles. It’s Air China today. The beverage cart makes its weary way down the aisle. The flight attendant holds up that little carafe. Ka-fay? You don’t speak Turkish. You don’t speak Finnish. You don’t speak Mandarin or Cantonese. None of these languages is remotely related to English. In fact, none of these languages are even in the same language family. Yet you can recognize, within the two quick syllables of kah-vay, ka-vee, and ka-fay, the word you know as coffee. As a frequent flier, you’ve picked up Kaffee in Berlin and caffè in Rome. You travel to Lagos, Nigeria, and pick out kofi on the menu; you order kŏfī in Delhi, India, and кофе in St. Petersburg, Russia. In Seoul, South Korea, you’re brought something that sounds like ka-pee, and in Tehran you’re served gah-veh. It’s always recognizable: the two reliable syllables, the seesaw of vowel sounds punctuated by velar stops and fricatives. Why is that? What you’ve stumbled upon, of course, are cognates. Lots and lots of them. These are words that share the same root, and, often enough, they’re a good indication that two languages developed from a common ancestor. Take the milk, for instance, that you put in your coffee. The milch they’ll pour for you on Air Hamburg is highly reminiscent of the melk you get on both KLM and Norwegian Air—which is no big surprise, since English, German, Dutch, and Norwegian are all derived from a long-ago language called Proto-Germanic. And the fact that you can get mléko on Czech Airlines, even though Czech is not a Germanic language, is evidence that Germanic and Slavic languages share an ancestor that goes back even further. That is, if you could fly back 5,500 years ago, Proto-Indo-European Air would serve you melǵ. But one of the tricky things about cognates—true cognates—is that they aren’t always an indication that two languages share a common ancestor. 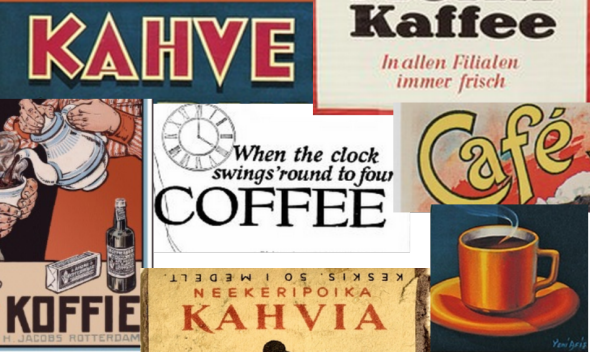 Finnair’s kahvi sounds an awful lot like American Airlines’ coffee, but Finnish and English grew on entirely separate language family trees. Finnish is Uralic and English is Indo-European. On the other hand, many, many coffee cognates can indeed be found among the several hundred languages spoken today that are rooted in that largest of all language families, Indo-European. Yet despite the shared lineage of these languages, which range from German to Spanish to Urdu to Slovak, their similar words for coffee can’t be attributed to their common ancestor. Instead, you’ll find the roots in classical Arabic. Yes, coffee is a loan word. That is, it was borrowed, fully formed, from another language. As was the Italian caffè, the Swahilli kahawa, the Vietnamese cà-phê, and dozens of other variations. The great majority of languages borrowed their word for coffee. Unlike the words for, say, milk or water, which developed within a given language family over thousands of years, the word for coffee hopped from one language to another, and within a relatively short period of time. That’s because coffee was a novel commodity. People picked up the word as they picked up a cup of the curious beverage at a coffeehouse or picked up bales of the beans en route from one trading port to another. To trace the history of the word, which encompasses the development of its many cognates, is to trace the routes of travelers, traders, and colonists in the early modern world—and beyond. Both beverage and word seem to have originated in 15th-century Yemen. Although the coffee berries were initially brought over from the Ethiopian highlands, it was the Sufi Muslims of Mocha who first thought to roast, grind, and brew the hard seeds inside the pulpy fruit. Bun is what the Oromo people of Ethiopia called these berries; the Sufis, then, dubbed the potent beverage they brewed qahwat al-bun, which means something like “wine of the bean.” They drank this qahwah, as it came to be known, to invigorate their nocturnal prayer rituals. If we can believe this etymology, the word that would eventually spread around the world is firmly Arabic in origin. However, another just-so story persists, which is that the Sufi’s word, qahwah, referred to the Kaffa province of southwestern Ethiopia, where bushes of coffee also grew in the wild. Recent plant genetics research has poked a small hole in this second theory, though, suggesting that the Yemeni Muslims picked up those first coffee berries from a varietal in the east of the country—closer to Yemen and far from Kaffa. In any case, qahwah was the word that spread. Following its introduction in other Sufi communities in Cairo, Damascus, and Mecca, the dark “liquor” became a social beverage throughout much of the Islamic world—possibly as far as the Malabar Coast of India. By the early 16th century, beans cultivated in the Yemeni mountains were being exported via Red Sea and Indian Ocean trade routes, as well as by desert caravan. But qahwah, you see, contains several sounds that are difficult for non-Arabic speakers. Listen to it here, and see how well you do at imitating it. You probably had trouble mimicking that initial “q,” for instance. Is it a k? A g? It sounds slightly different from both of them. That’s because the Arabic /q/ is created using the uvula, the dangly bit at the back of your throat, which many languages—including English—don’t even use. And that middle sound…is it an h? A w? A v? An f? It’s closest to the hw sound that some English speakers produce in which and where, distinguishing them from witch and wear. And finally, there’s that h sound at the end—a sound in itself not uncommon, but not typically articulated at the end of a word. All in all, a rather difficult combination. So, as the word qahwah traveled, its sounds shifted slightly. People pronounced it using sounds more consistent with their own language, sounds that formed more naturally in their mouths. In some Arabic dialects, qahwah came out like gahwah. In the languages of Kurdish and Berber tribes, the open-mouthed ah’s might close a bit, resulting in an eh or uh sound. And in Persian, people called the new drink ga-hveh. As the Ottoman Empire conquered vast swaths of Arab lands in the 16th century, the Turks, too, picked up the habit of qahwah-drinking. And here there occurred several shifts in pronunciation that would be key to the subsequent names of this dark drink around the world. Like many languages, Turkish doesn’t have Arabic’s uvular /q/ sound in its phonetic repertoire. To the Turks, /k/, produced with a closure slightly more toward the front of the mouth, sounded close enough. (Something like an English speaker’s rendition of “Iraq”—as if it were “irak.”) Somewhat unusually, Turkish also lacks a hw or w sound; an /h/ added to the Turkish /v/ sound was as close as the rulers of the Ottoman Empire could come. (If you try it, you’ll notice that both sounds involve some breathiness and lip movement.) And they just avoided the tricky /h/ at the end of the word altogether. Ultimately, in Turkish mouths, the new drink sounded something like ka-hvay, written kahve. It’s not clear why the final vowel changed from the short a in “ma” to something more like the long a in “may,” but it might have been influenced by the Persians right next door, who had done something similar. People within other territories of the Ottoman Empire encountered Turkish kahve and adapted it still further to fit the sounds of their own language, reducing the rather difficult /hv-/ into just plain /v/ or /f/. Ka-va, Slovenian, Croatian, and Ukranian speakers would call it. Ka-fa, is how it came to sound in Serbian and Bosnian. And in Albanian, Macedonian, Greek, and Bulgarian, people brewed ka-fay. (The exception that proves the rule in this empire of coffee cognates is found in the Armenian language, where the drink is known simply as soorch, supposedly in imitation of the sound of slurping coffee.) And, as the curious new beverage found its way to Europeans, the game of translingual telephone continued. The first Europeans to encounter this novel “black water” were travelers and traders in the region broadly known as the Levant, and their written records offer us an amusing history of how a foreign word is slowly folded into another language. The earliest account from the continent was that of a traveling German botanist and physician, who in 1582 described the “black as Ink” Chaube he’d been served in Aleppo. Venetians, however, who had occupied a portion of Constantinople for centuries and established a consul in the trade city of Alexandria in the 14th century, were probably the first Europeans to try kahve or qahwah. And sure enough, in 1585, the Venetian city magistrate of Constantinople reported that that the Turks “drink a black water as hot as they can suffer it, which is the infusion of a bean called cavee.” In 1592, another Italian, this one from Padua, published a treatise in Latin called The Plants of Egypt, referring to the caova he’d drunk in Cairo. 1615 gives us another Italian rendering from another Venetian in Constantinople: cahue. Real integration of the word into European languages would come with integration of the beverage into people’s everyday lives. This occurred gradually in the latter half of the 17th century and into the 18th. During this period, what might variously be called Copha, cahve, cahue, or Caffao—to name just a few of its monikers—would shift from being a novelty among the European elite and a few émigrés, to being promoted by apothecaries for its curative powers, hawked by street vendors, and eventually to being the expected libation at coffeehouses, which arose in the mid-17th century. By the early 18th century, the word for coffee no longer hung like an exotic curio in European mouths. Coffee had become the standard spelling in the pamphlets and periodicals that circulated in the English coffeehouse, un prise de café appeared on French price-setting documents; and La bottega di caffè, the title of a popular Italian comedy in 1750, reflected a spelling that had been common for decades. But that was just Europe, the Arab world, the Ottoman Empire, and a few far-flung Muslim countries. There remained the rest of the world for coffee and its cognates to infiltrate. This, unfortunately, was largely the job of European colonization. The Dutch were the first Europeans to try cultivating koffie shrubs in one of their colonies. It’s why the beverage is called kofi in Sranan Tongo, the lingua franca of Surinam. Similarly, cultivars of koffie in Java became known as kopi (ko-pee) in the various dialects of Javanese. British coffee in Ceylon, became kappi in the Tamil language. Spanish café plantations worked by Filipino laborers brought the cognate kapé into Tagalog. As we’ve seen, speakers of one language don’t go out of their way to pronounce unfamiliar sounds from another language. So in languages that had no other words containing the ffff sound, people used the closest sound they did have: either matching the use of the lips by using p or matching the breathiness by using h. And so the coffee cognates that had emerged from Turkish or Arabic in each European language morphed into still other cognates in native and creole languages throughout South America, Africa, the Caribbean, and South and South East Asia, from the late 17th century through the early 20th. A more eclectic process introduced the word to East Asian countries. China’s cognate, ka-fay, reflects the pronunciation of the French missionary who is said to have planted café beans in 19th-century Yunnan. The Japanese may have first tried koffie via a Dutch merchant at the island of Dejima in the 17th century, leading them to call the new drink ko-hee—although it would not catch on until Brazilian café companies promoted it in the 20th century. Similarly, while the Russian ambassador to Seoul is supposed to have introduced ko-fye to the Korean king in the 1890s, few people drank it until instant coffee appeared on U.S. military bases during the Korean War, when perhaps the more distinct pronunciation of ka-pee emerged. One could go on, but suffice it so say that, at this point in history, you can reliably find a coffee cognate most places you travel. And should you need sugar for that cup of cognate, or perhaps even feel like trying tea or hot chocolate for a change, know that you’ll remain among cognates. The shek-air that you’ll find on Turkish Air, the tee that you’ll find on Finnair, and the chow-kuh-lee on Air China have histories of trade and travel not so different from that of coffee. 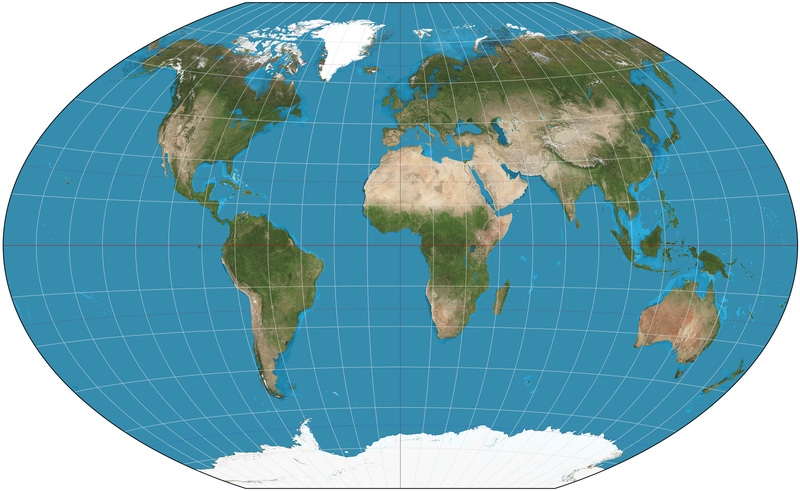 Here’s the approximate locations for some of the words for coffee.